Many people are planning to visit England to catch even a fleeting glimpse of Prince William and Kate Middleton on the day of the Royal Wedding . Parties are planned all over the UK, as revellers and well-wishers will be given a public holiday to let their collective hair down. Hotels in London have already been booked up, so cunning clever organisers have come up with a most daring plan. 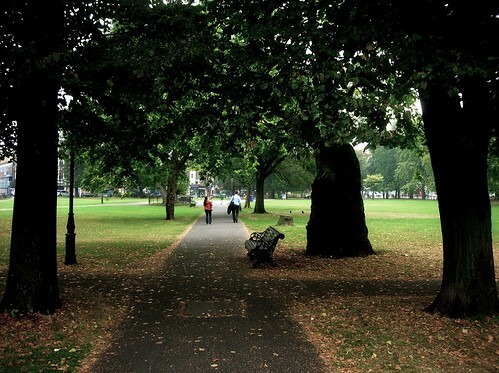 Clapham Common, pictured, will become the venue of a massive sleepover party. Visitors can bring their sleeping bags and tents (or rent luxury ones) and camp out for 3 nights during the wedding festivities. This 220 acre park is situated in South London, and is a popular venue for parties and major events. 'Camp Royale' as it will be known, will be available from 28th April, to the 1st of May. Cost - from £75.00. Organisers have buddied up with National Express and Yorkshire Tea , so guests will be offered discounted rates of travel, all topped off with a nice cup of free, British tea. Prizes will be awarded for best, interior tent decor and campers will have access to stylists if they desire to be 'poshed-up'. Apart from Clapham Common (an historic park), there are several other interesting things to see around Clapham: air-raid shelters and tunnels, bunkers, parks, celebrities -go-go, the Holy Trinity Church, cinemas, venues, shopping hot spots and many more. If you're travelling to London for the Royal Wedding and can't afford an expensive London Hotel bill, you may want to join the 10,000-strong (expected) Wedding invitees gate crashers. There will be wall-to-wall security, hot showers, toilet facilities and a huge 20m-screen TV.